Thanks fellas. I still have to paint the log tongs a rusty color. I left it shiny and new so you could see it against the brown logs. I love your idea for the logging tongs Tom. Ingenious idea for your logging tongs, that is a talent in its self, to see something and use it as/for something else. I'm going to remember this idea and give it a go. I love your logging scenery/pictures. Fantastic work! Even if nothing operated this would be wonderful modeling. I�m looking forward to the video. Thank you again guys. You all are great modelers and getting these positive comments is a real thrill. Well, it was sunny and mild this January day in 1910 Kentucky. 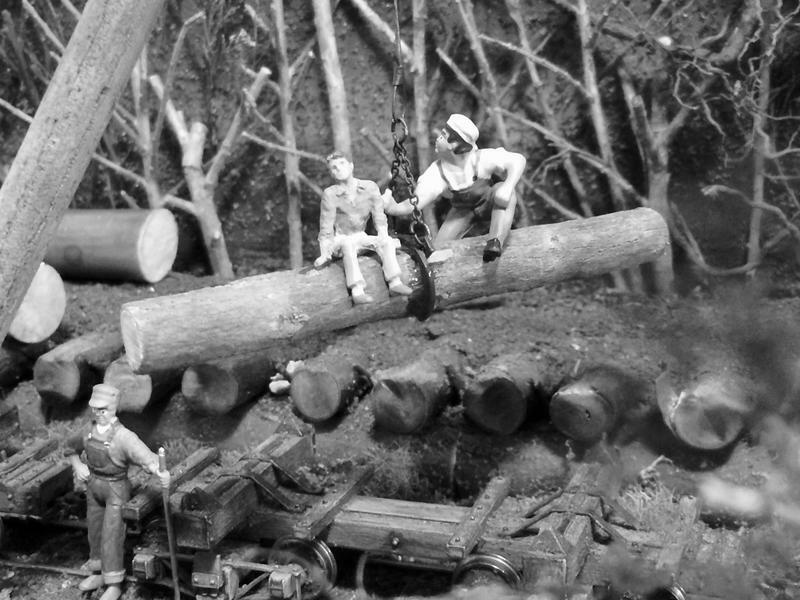 Since it was a day of rest, Sunday, the boys thought they should play and enjoy some �Tom foolery� and some backwoods �Hi- Jinx.� So they fired up the log loader, carefully balanced a log and went for rides up and down. Better than any amusement park ride. 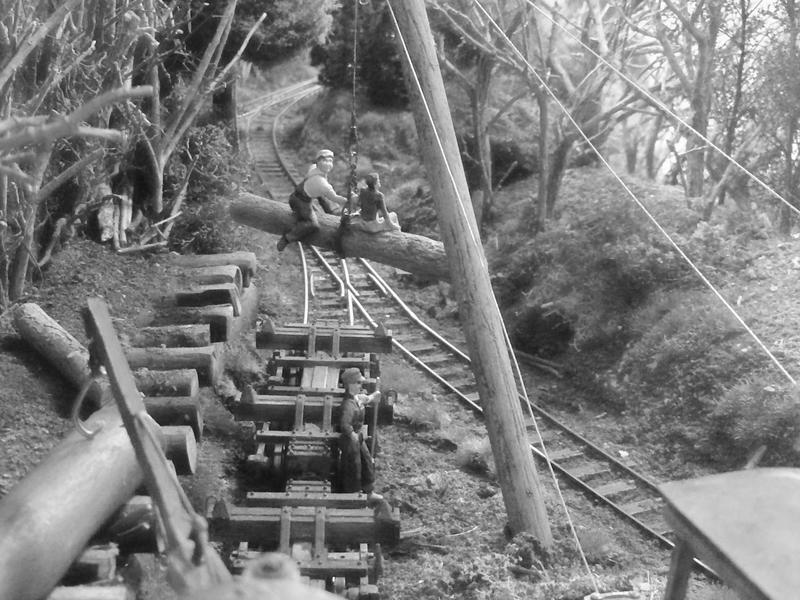 A visiting photographer captured the quintessential logging picture for posterity. I'm sure one of those guys started his "Tom foolery" with "hold my beer". Well, I went ahead and made a video of the steam donkey in action at the log dump. I love it! Your music is a good choice also. Something Model builder Howard Zane would be picking. Nice scenery work going on there. Thank you Louis. I appreciate the kind words. 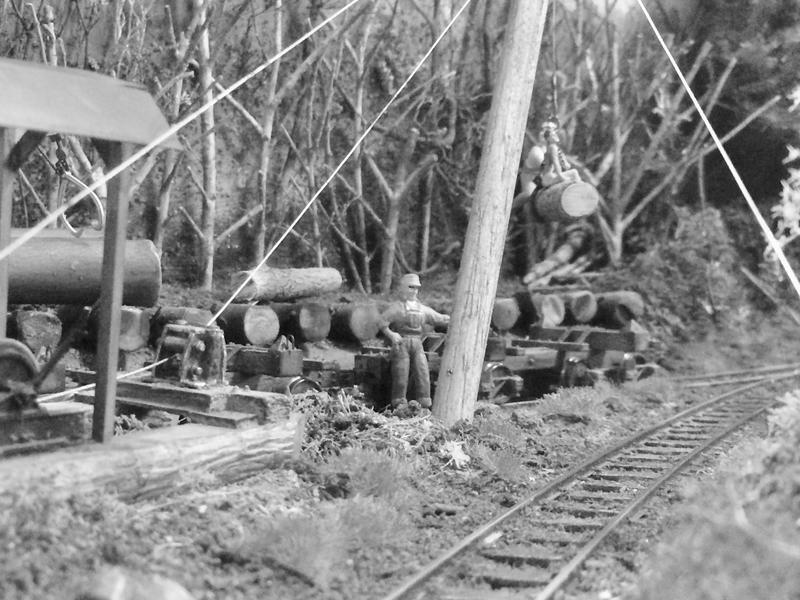 I hope to do another video of the log landing/loading on the other side of the mini layout soon. Love the video!!! The credits are a hoot!!! Adding the automation to already good looking layout is a very nice touch.